Now that we have completed all the pages in our shape book, it was time to make the cover. 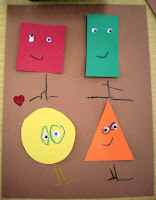 Before we started I passed out the laminated shapes we used each week to introduce the shape. 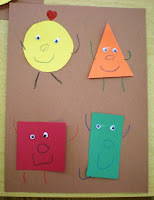 As we sang our shape songs, the children had to decide which shape we were singing about and hold it up. The triangle is still tricky. The cover is a bit of a more involved skill time activity so that was all we did today. 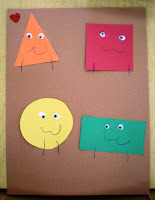 At the table each child got the four shapes already cut out. We made little shape people for our cover. 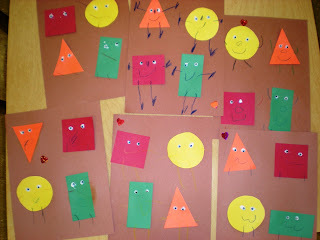 After the children glued down the shapes, we added eyes, faces, arms, and legs. They are very basic, but they have a bit of character. I just have to staple them all together and off to home they go! 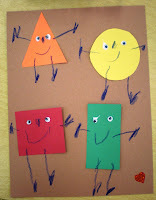 Great idea these are so simple but ideal for nursery children.